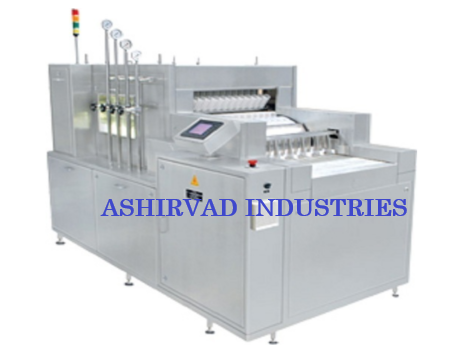 Production Speed 120 to 240 Vials / min. Overall Dimension 2300mm x 1000mm x 915mm. Input Specification (Container Diameter) 25mm to 70mm. Electrical Characteristics 440 Volts, 3 Phase, 50 Hertz, 4 Wire System. Optional Accessories Pumping Station, Inspection Station, Loading Platform, Programmable Logic Control with GUI. Change Parts Infeed Worm, Infeed Star wheel, Infeed Inverter, Exit Feed Worm, Exit Star wheel, Exit Inverter.